I'm glad that my parents love Schnauzers. Here is a pic of the Schauzer who they rescued in Cincinnati that is about 3 hours away. Skooter was very skinny when they saved him. Comments for This is Skooter - is he a Schnauzer??? So Great to hear back from everyone. I am so happy that my question about Skooter was answered! My Mom and Dad love him so much and would love him no matter what. Thanks for your answers. He looks like a Schnauzer to me!!!!!! I rescued one as well and he was skinny but he will put on weight! Schnauzers are great pets!! You will love him and he will love you esp. because he knows you rescued him!!!!! Enjoy each other!!!!! 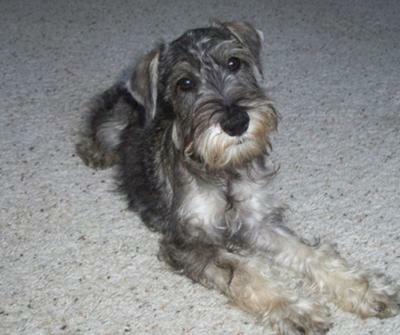 As much of a schnauzer as a schnauzer can be....he is lucky to have been found by good people. He will fatten up in no time!